As negotiations were under way with the United States for the guns of the first large monitor, First Lord of the Admiralty Winston Churchill and First Sea Lord Sir John Fisher searched for other weapons that could be used to arm additional ships. The problem was not gun barrels — each class of eight British capital ships were ordered with about five spare guns — but rather complete turrets with their mountings which were much more difficult to find. The obvious solution was to use those of obsolete pre-dreadnought battleships, but their 12-inch guns could only reach about 13,700 yards, totally insufficient for a monitor. This however was when built and gunnery experts discovered that with relatively little effort the apertures could be enlarged and the cradles allowed to pivot further, all allowing the maximum elevation to increase from 13.5 to 30 degrees and the maximum range to reach 21,000 yards. With this news the Admiralty ordered eight more monitors, virtually identical to those equipped with the American 14-inch guns, but instead carrying British 12-inch 35-calibre weapons. They were taken from four of the Majestic-class pre-dreadnoughts, Hannibal, Mars, Magnificent and Victorious, and like their predecessors were given the names of generals. Seven of the names were predictable, being Sir John Moore, Lord Clive, General Crauford, Earl of Peterborough, Sir Thomas Picton and General Wolfe. But one, Prince Eugene, is a little remarkable as being named after the premier commander of a country with which Britain was at war! Presumably this was Churchill’s idea, as an exceedingly proud descendent of the Duke of Marlborough, with whom Eugene had fought during his greatest victories. And of course it was Germany, not Austria-Hungary that was despised by the great British public. Earl of Peterborough at Mudros in 1915. Roberts is in the left background. The lighter guns and mountings allowed the armour belt to be increased from the four inches in the previous class to six inches, still sloped at an impressive 45 degrees. They were also a little faster in service, although still only reaching 8 knots, well under the designed speed. Two of the ships, Peterborough and Picton went to the Mediterranean where they bombarded the Turks at Gallipoli and Salonika and the Austrians east of Venice. There they were accompanied by Italian monitors, a typical large variant being Faa’di Bruno, illustrating the great difference in design theory. She mounted a pair of very powerful 15-inch guns but like the American monitors was incapable of safely facing the open sea. The other six would spend their careers attacking the Flemish coast. Their success tended to be a function of the relative range of their guns and those of the coast defense batteries the Germans were forced to establish. In 1915 their performance was adequate as the only serious opposition was the Hindenburg Battery with its old 11-inch (Imperial rather than metric is used to allow for an easier comparison) guns. The situation quickly changed when Tirpitz Battery was completed with guns of the same calibre but newly built by Krupp and capable of firing up to 30,000 yards even with standard ammunition. Fortunately monitors with bigger and newer guns were under construction. The worst ship in the Royal Navy, the monitor Marshal Ney. The mounts and turrets became available when the battleships Renown and Repulse were re-ordered as battle cruisers. You will find their battleship-style counters in U.S. Navy Plan Red. Using the two mounts available Marshal Ney and Marshal Soult were ordered, their names a very tactful recognition that the French were now allies, not enemies! Their armour was identical to that of the 12-inch monitors and so, originally, was to be their engines. Unfortunately someone in authority (just who was later vigorously debated) decided that they were to use a couple of sets of already constructed diesel engines. The Vickers engines in Marshal Soult though underpowered were usually reliable. Those for her sister ship were a disaster, not really surprising since they were built by the German company of MAN, which was highly unlikely to provide the specialized technicians and spare parts needed to fix them! 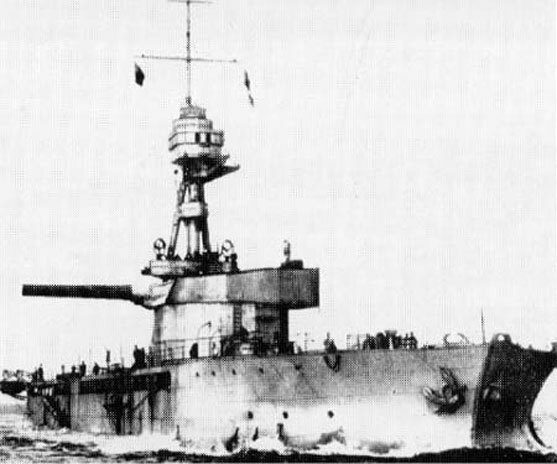 As a result Marshal Ney was an unqualified failure, called "the worst ship in the Royal Navy" and had her turret removed to be used in the much more advanced monitor Terror. By a strange coincidence one of its barrels was eventually on the Renown when she was sunk by the Japanese. It was replaced, first by a single 9.2-inch gun, and then by six 6-inch and with these, immobile by failure or intent, she served the rest of the war as a guard ship in the Channel and its ports. 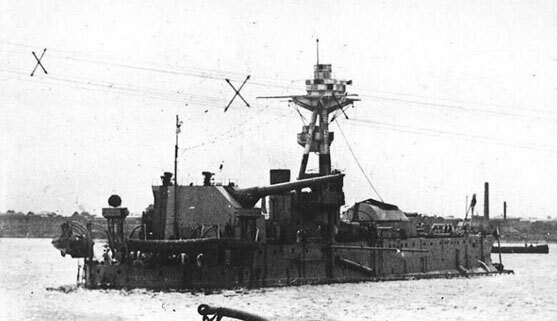 Marshal Soult in contrast was the most effective bombardment ship in the navy until late 1917, even thought she too could only achieve a little less than seven knots. Her range of 32,200 yards allowed her to fire with relative safety. Even when her guns started to wear it was discovered that, just as in the earlier monitors, she could flood her offshore bulge, creating an effective three degrees elevation to the guns. Although several prolonged shoots were carried out, with apparent success, it was discovered after the war that relatively little damage and very few casualties were inflicted on the Germans. However these monitor attacks did force the German Army and Navy to massively reinforce their coastal defenses. In late 1916 the new Kaiser Wilhelm Battery with four 12-inch guns was completed and those of the Tirpitz Battery had their range and accuracy improved. General Wolfe with her 18-inch box-mounted heavy gun. Despite these new ships it was evident that they could soon be outmatched by new German installations, as indeed they were when the Deutschland Battery with four 15-inch guns was completed in April 1917. 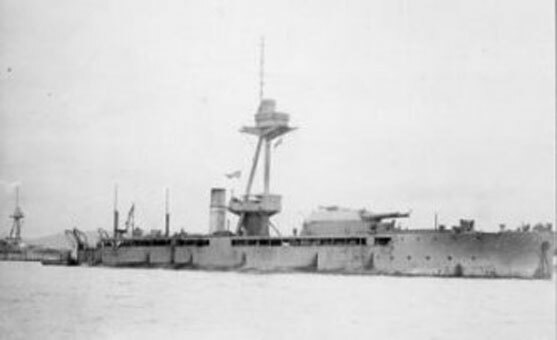 By then Admiral Bacon of the Dover Patrol had persuaded the Admiralty to mount a single 18-inch gun on some of his monitors. Obviously this could not be a turret, even though that of Furious from which they came had minimal armour, but it was possible to place them in a semi-fixed "box" on the stern of Lord Clive and General Wolfe, firing to one side only. The elevation was boosted from the 30 degrees in the battle cruiser mount to an impressive 40 degrees allowing for a range of 40,500 yards. Players that wish to use such a monstrosity — with two 12-inch and one 18-inch in 6,000 tons perhaps the most over-gunned ships ever built — when playing a Great War at Sea scenario should beware. Although the biggest gun was deadly when firing the right ammunition — it could penetrate 18 inches of the best armour at 15,000 yards — there are two problems. First, like all monitors a large proportion of the ammunition was high-explosive. Second the gun could only traverse up to 10 degrees! The big guns performed well, combining the impeccable accuracy and reliability of the 15-inch with extra range and power but the ships only came into service a few months before the Armistice. In the following years all but one of these ten monitors were scrapped, the sole exception being Marshal Soult which remained in active service for the next fifteen years serving as the principal gunnery training ship of the Royal Navy. In 1940 it was suggested that she be refitted but her hull was worn out. Her turret went instead into her replacement Roberts, one of the four monitors that fought during the Second World War. Jutland is now available — click to order!